Titan Production Equipment has officially opened for business, completing its acquisition of Exterran Corporation’s North American production equipment business. The new company plans to scale up quickly, aiming to become the market leader in the design, engineering and manufacture of oil and gas production equipment used to separate, process and treat hydrocarbon streams – including glycol regeneration dehydrators, as well as two- and three-phase separators. Titan’s massive 210,000 square-foot Columbus, Texas production facility is one of the largest of its kind in the United States. With a capacity to manufacture more than 4,000 units a year, Titan’s plant features a fit-for-purpose layout designed for high-volume, complex manufacturing. “With our acquisition complete, Titan is taking orders, serving customers, hiring employees and ramping up production,” says Chris Werner, CEO for the new company. The oil and gas production equipment market is dealing with a lack of manufacturing capacity, explains Werner, leaving customers with long lead times, product quality issues and limited engineering support. But Titan’s expansive manufacturing capacity puts the company in a unique position to relieve market constraints, says Werner. For customers with unique requirements, Titan features a veteran, in-house engineering team able to design specific solutions. Titan’s acquisition also included what is considered an industry standard – Exterran’s portfolio of production equipment engineering designs and drawings. Titan is continuing an oil and gas field legacy that began in 1927. The company began as Smith Industries, becoming Hanover-Smith and then Exterran before Castle Harlan, Inc., a private equity investment firm, acquired the company’s North American production equipment manufacturing assets and created Titan this year. Titan Production Equipment was founded in 2018. As a 100% production equipment-focused company, Titan provides a high level of service, quality and capabilities to fulfill customers’ equipment needs around the separation, processing and treating of oil and gas hydrocarbon streams. 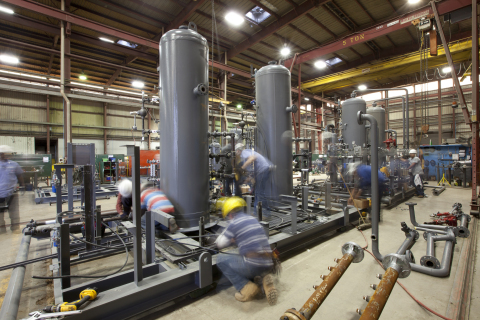 Titan offers deep engineering expertise and has capacity to manufacture at high volumes in an ASME-certified facility that produces both pre-designed and custom separators, heater treaters, glycol dehydration units, as well as a wide range of other production equipment products. Additional information about Titan Production Equipment can be found at www.titanpeq.com.